A first hint that your regulation regime helps create a cartel is a strong endorsement from the regulated industry. It's not always so - sometimes industries welcome things that are less bad than they'd otherwise expected. But still. Auckland's requiring licences to run suntan beds. Auckland will be the first city in the country to license sun beds and slap an age restriction on their use. Auckland Council will require commercial sun-bed businesses to be licensed and comply with a new code of practice including restricting use to those 18 years and over. The requirements are part of a new Health and Hygiene Bylaw passed by the super-city council's Governing Body today that will replace those of the seven former councils from July 1 next year. Also caught in tightened health laws will be any businesses that "risk breaking the skin" - such as hair removal, manicure/pedicure and exfoliation. Licences will be required for commercial services that pierce the skin such as body piercing, tattooing and traditional tattooing. Traditional and non-commercial ta moko undertaken by artists on, or under the authority of, a marae in the Auckland region would be exempt. "Licensing gives us a method to monitor areas where we believe there is the highest risk to peoples' health through poor practices, while the code of practice gives the industry a good guideline of what is acceptable," Quax said. I hope that all of this sticks to very general sanitary code kinds of rules rather than processes that add substantially to small businesses' fixed costs. These kinds of occupational licensing rules have completely run amok in the US. Let's not import this particular kind of stupidity. We don't really need big barriers to entry for immigrants setting up pedicure shops. I've been skeptical about LVR regulations. If adopted as a "thou shalt not loan more than x% of the house's value" commandment applying to all new loans, they would have substantial effects on first home buyers unable to lean on family for support. If Matt Nolan is right that the banks really still have some implicit guarantee despite the OBR mechanism, there could be public interest in such regulations; a serious recession coupled with housing bubble collapse would then have banks taking a large hit while auctioning defaulted properties. But, any "making houses more affordable" justification for the regulations seemed exceptionally weak as the policy seemed likely to induce a level shift followed by a return to the prior price path. In other words, we'd be back on the same path of housing price appreciation after a one-off drop in prices concentrated among those homes favoured by first home buyers. Implemented this way, much of the beautifully written snark I had prepared now has to be deleted. * The equity effects still hold, but in attenuated form. When property prices start ramping up along with LVRs, first home buyers without family backing will get hit even more strongly than they are currently, but so long as the LVR proportion is set sensibly, it won't bind most of the time. Further, RBNZ recognises all the workarounds that are likely to emerge. Parents will take out a mortgage on their paid-off homes to lend to the kids as starter capital; there's nothing the bank can or should do about it. A secondary loan market will emerge, but borrowers there will incur higher interest rates than they would in the mortgage market, so the system still works to discourage high LVR loans at the margin. I'm still having a hard time seeing how the policy has anything but transitional effects on home affordability though. I would expect the regulation to result in a one-off drop in the price of starter homes, followed by a move back to the prior expected path of price increases. Effects on homes farther up the food chain will be rather substantially attenuated as the LVR is still less likely to bind for those with reasonable existing home equity to apply to a new home purchase with the sale of the old one; ability to service the mortgage out of existing income ought to bind before the LVR does for anybody with enough equity. NBR notes that John Key wants first-home buyers exempted from the rule; I have a hard time seeing that it would be binding on anybody under that scenario unless lots of folks are buying investment properties with no equity. If lots of investment properties are being bought on very high LVR loans, then I move from mildly meh to somewhat in favour of the regulation change. I agree with Nolan that the RBNZ doesn't have a housing affordability mandate. The best reason I can see for RBNZ's running this is as part of its prudential supervisory role looking over the banks so that they're less likely to take on too much housing risk in the expectation of being able to lay it off on taxpayers in case of a substantial downturn. ** I have a much harder time seeing this as part of inflation policy: CPI is based on rent, not property prices, rents seem to lag prices, and I doubt that the policy has much effect on housing prices except among the homes purchased by first-home buyers, and even there only tapering off peaks as LVR spikes. * The Game of Thrones analogy might have been overwrought anyway; you'll now never get to judge. The Ministry of Health has an RFP out looking for an evaluation of their overall tobacco control policies; they want to know whether they could be more effective in getting to a zero-tobacco New Zealand by 2025. Whether NZ should be Smokefree in 2025 is out of scope, but as it's policy set by the Minister, it's not really MoH's job to commission somebody to suggest that the government's priority is wrong here. Or, at least that's how it should be. When the Government isn't sufficiently anti-alcohol or anti-tobacco, there seems to be plenty of money to fund NGOs to urge the government to change its policy. The financial cost to society of smoking has been estimated to be $1.685 billion per annum (approximately 1.1% of GDP). Major components of this cost include loss of productivity associated with premature, smoking-related morbidity and mortality, and preventable healthcare costs. Interventions that reduce the prevalence of smoking are cost effective actions that can reduce poor health outcomes and the associated costs to the health system. $15m from smoking-induced fires (some of which will fall on the fire department). More than a quarter of total reported costs are smokers' expenditures on tobacco. It's the second largest component overall. It's be kinda hard to tell that from the MoH summary though. Why do they keep pulling stuff like this? Without trying to calculate a precise estimate of 'external costs' it does seem reasonably apparent that the tax contribution of approximately $1 billion annually by smokers exceeds substantially the external costs of smoking which fall on non-smokers. If savings on pension costs from premature mortality of smokers were added as well the net fiscal contribution of smokers, to the fiscal gain of non-smokers, would be further increased. I do hope that whoever winds up running the evaluation gives some thought to the cost-effectiveness of e-cigarettes in promotion of SmokeFree 2025. I wonder how John Key will pay for all the roads and stadiums without the net $650m/year or so that smokers contribute. Two years ago, the government proposed banning the import of used cars failing to meet the Japan 05 standard. This effectively banned the import of a large chunk of Japanese cars that, while old, were newer than the New Zealand fleet median age. I expected that this would wind up encouraging those with older cars to hold onto them for rather longer, as relatively newer substitutes would become more expensive. Whether this wound up increasing or decreasing the average fleet age depended on how many held onto those older cars relative to the number who moved to buying rather more expensive newer cars instead of the 1998-2005 Japanese imports that had been pretty popular; that in turn would depend on the price effects. The regulation looked like it would wind up being pretty binding, at least for the first few years. New Zealand car owners' reluctance to dump their old bangers is contributing to a growing national car fleet and making the roads less safe, the Motor Trade Association says. Association spokesman Ian Stronach said it was the result of the large number of 1995 - 1997 registered used import cars which flooded into the country during the early 2000s. "Most of these cars are still being used and skew the age profile of our car fleet. Today, the average age of New Zealand's car fleet is 13.8 years; that is old by world standards and probably beyond the original design parameters of some models." The average fleet age in 2010 was 12.88 years. So, since the regulation change, the average fleet age has worsened by a year. It would take more work to show that the change is due to the regulation, but we can say that the change is consistent with my prior "unintended consequences" hypothesis. Eric posted yesterday on Ed Glaeser's upcoming Condliffe Lecture at the University of Canterbury. Some of you have if the talk will be videoed, given that you are not based on Christchurch. Absent any technical hitches, the talk will be posted on YouTube as part of the University's What If series of public lectures, a week or so after the talk. But if you are based on Wellington, you can go one better. Why not register now for the annual conference of the New Zealand Assocation of Economists, which is taking place at the Amora Hotel in Wellington next week--Wednesday July 3 - Friday July 5. Ed is giving a keynote address at 4:00 on Wednesday. Other keynote speakers are Maurice Obstfeld of Berkeley, John Riley of UCLA, Mardi Dungey of U. Tasmania, and John Quiggin of U. Queensland (best known in the blogsphere as one of the authors at Crooked Timber). Quite apart from the keynote addresses, the conference will also feature TVHE's Matt Nolan, who is presenting a paper and also participating in a panel discussion on the Open Banking Resolution, along with Ian Woolford from the Reserve Bank and Bank critic, David Tripe; and I will be presenting my work on Do Catches win Matches. Groping to Bethlehem's and Association Vice President, Bill Kaye-Blake, is not giving a paper this year, but he will be at the conference. The full conference web site including the link to registration and the programme is here. I hope to see as many of you there as possible. I really wish that the Law Society's submission on the GCSB bill had been available prior to the submissions deadline. I suspect that I'm not the only one who failed to submit on the Bill because the precise changes from the status quo ex ante, and whether the changes were from the de facto or the de jure status quo, were, to a non-lawyer, sufficiently impenetrable to require several days' effort to decipher. The Law Society instead makes it all nicely explicit for us. We are transforming a foreign intelligence agency into a domestic intelligence agency with minimal effective supervision. That's what it had looked like, but I sure wasn't qualified to say so. And so I didn't submit. The Law Society notes that the Telecommunications Interception Capability and Security Bill violates basic rights to natural justice at common law because too low a threshold is established for the Courts to be able to prevent defendants from hearing evidence against them. The Bill is intrusive. It would empower the GCSB to spy on New Zealand citizens and residents, and to provide intelligence to other government agencies in respect of those persons. It is inconsistent with the rights to freedom of expression and freedom from unreasonable search or seizure under NZBORA and with privacy interests recognised by New Zealand law. Given the intrusive nature of the reforms and the fact that they prima facie conflict with established rights, they should be demonstrably justifiable, and be accompanied by appropriate safeguards. The Law Society has sought to undertake a proportionality analysis of the legislation to ascertain whether the intrusion on rights protected by NZBORA as a result of these measures is justified, and whether there are sufficient checks and balances on the powers the Bill proposes. Furthermore, it would appear that if the GCSB is called upon to assist another specified agency (such as the Police) by performing activities instead of that other agency, the activities performed by the GCSB in that capacity will receive the imprimatur and secrecy and immunity protections of the GCSB Act, when the same activities engaged in by the specified other agency itself would not do so in terms of the other agency’s empowering legislation. In that way, enlistment of GCSB “co-operation” may confer on the activities undertaken a protected legal status which they would not otherwise receive. Indeed, the very fact of GCSB involvement may mean that the activity in question is never disclosed to those affected. This outcome is unacceptable and inconsistent with the rule of law. justified, given the greatly expanded scope of this warrantless power (having regard to the expansive definition of “information infrastructure” and the expanded scope of operations beyond “foreign intelligence”, canvassed above so that domestic as well as foreign intelligence is to be targeted by the GCSB). This power must now be considered as overly invasive of NZBORA rights, and/or as a disproportionate conferral of power, given the available alternatives (including the range of powers of interception already possessed by the New Zealand Security Intelligence Service and others). Had this analysis been publicly available earlier on, and it likely would have been but for the Government's incomprehensible desire to push this through under urgency and thereby prevent public debate, I would have submitted in opposition to the Bill. I wouldn't have done it with my economist hat on, because I can't quantify any of this. It would be my Mont Pelerin Civil Rights Libertarian hat instead, though informed by the economist side. I would have taken the Law Society's analysis as baseline, then noted that New Zealand's main apparent economic comparative advantage is in having a robust policy environment that weighs heavily the civil rights of its citizens and residents. That we're a bastion of sanity where policy doesn't over-react to perceived security threats. That we're the place that very sensibly adopted the only realistically effective airport security precaution subsequent to an attempted hijacking by a deranged woman: harden the cockpit doors against entry. We haven't gone for American airport security theatre. We haven't started having roadside checkpoints where people are commanded to present their papers and prove that they're not in the country illegally. And that this comparative advantage matters all the more as America and the UK get worse: the Outside of the Asylum is more attractive when the Inside of the Asylum gets that much nuttier. The right of the people to be secure in their transactions made through electronic media and other forms of communication, and in the data generated by such transactions, shall not be violated, and no Warrants shall issue, but upon probable cause, supported by Oath or affirmation, and particularly describing the place to be searched, and the persons or things to be seized. The people will retain the right to review such warrants and challenge them in the courts. The US and OECD have been cracking down on so-called tax-havens; would that New Zealand could be excoriated by the Surveillance States as a rights-haven: a little dark blot on their surveillance maps where you have to get a real warrant from a real judge to be able to wiretap people, and to prove that there's a damned good reason for it. And be a place of refuge for those few who care enough about those kinds of freedoms to vote with their feet. I wonder what the tech scene here could look like, in a decade's time, if some of the folks in Silicon Valley who do care about these things saw New Zealand as safe haven. Peter Cresswell points to what we need to do to start protecting ourselves, if we're to be inside the asylum. Tyler Cowen pointed to a site highlighting all the currency notes featuring the pictures of scientists and mathematicians. I was interested in the implied scientist exchange rates. If an Euler is worth 10 Swiss Francs and a Rutherford is worth 100 New Zealand Dollars, and a Swiss Franc is $1.38 NZ, is a Rutherford really worth 7.23 Eulers? I hardly think so. Rutherford was great, but if we're having some fantasy league of most-important-scientists-and-mathematicians, I'd trade a half-dozen Rutherfords to get a single Euler. Euler is then here underpriced. Fun Twitter comments on same, though note that I had the exchange rate wrong on Twitter first time round. @EricCrampton I'm more sad that the Schrodinger note isn't both legal and illegal tender. Definition of high-powered money: it's what happens as the velocity of the Einstein note approaches c! University of Otago Preventive and Social Medicine head Prof Jennie Connor, who is the chairwoman of a university group set up to tackle problem drinking, said students were drinking more heavily than they did 10 years ago. ''A larger proportion of all students drink and drink heavily. Not just at Otago but at all universities, and probably in the general population of young people,'' she said. The main driver of the change in drinking culture was the introduction of wine and beer sales in supermarkets and the lowering of the purchase age from 20 to 18. ''A whole new drinking culture has grown up around heavy drinking outside of a pub environment,'' he said. She was not quite so enthusiastic about getting more students to drink in pubs, but accepted there were more ''social aspects'' that came with that. I have no data on drinking by students at Otago, and it's very likely that Jennie would have that kind of data if it existed. But she's asserting that a larger proportion of students, and likely of young people in general, are drinking and are drinking heavily. And I do know the data on that one. "The largest drop in past-year drinking was among youth aged 15-17, whose rate fell from 75% in 2006/07 to 59% in 2011/12." Hazardous drinking dropped among youths who do drink. As fewer kids drink at all, the proportion of kids in total reporting hazardous drinking is well down. The trend from 1996/1997 through 2006/2007 was pretty flat, then dropped substantially through 2011/2012. She there didn't talk about the time trend, but the time trend was the big story in that survey. Here are the Selected Key Findings; I've bolded the relevant time-series youth-related ones. In 2011/12, most adults had consumed alcohol in the past 12 months (80%). This is fewer than in 2006/07 (84%). Decreases in past-year drinking were generally seen across all age groups, but particularly among 15–17 year olds. Among people who had consumed alcohol in the past 12 months (‘past-year drinkers’), one in five (19%) had hazardous drinking patterns. This is about 532,000 people. Since 2006/07, the level of hazardous drinking among past-year drinkers has significantly decreased for men (from 30% to 26%), but not among women (13% to 12%). People aged 18–24 years (particularly men) are at higher risk of hazardous drinking. Among past-year drinkers, about 44% of men and 26% of women aged 18–24 years have hazardous drinking patterns. However, the rate of hazardous drinking has decreased significantly in past-year drinkers aged 18–24 years from 2006/07 (49%) to 2011/12 (36%). 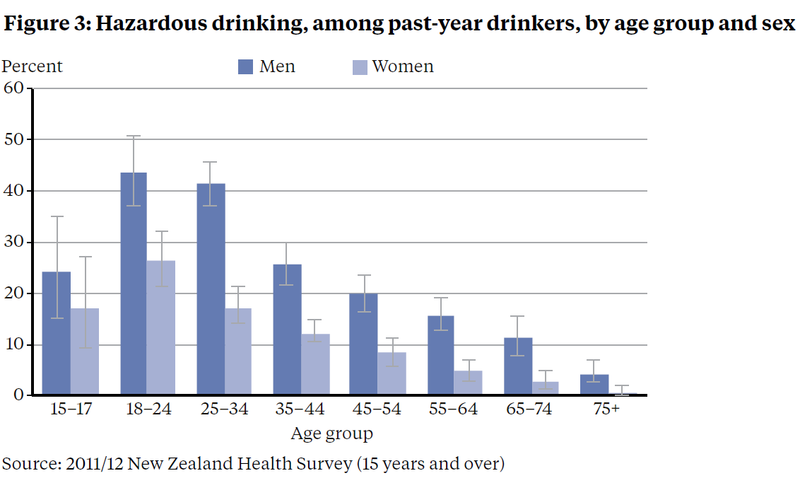 Māori have similar rates of past-year drinking as the total population, but have higher rates of hazardous drinking. Rates of hazardous drinking among Māori adults have decreased since 2006/07, (from 33% in 2006/07 to 29% in 2011/12). While Pacific adults are less likely to drink alcohol, those who do are more likely to have hazardous drinking patterns (35%) than adults overall (19%). People living in more deprived areas are less likely to have consumed alcohol in the past 12 months, but are more likely to have hazardous drinking patterns (18%), than people living in less deprived areas (11%). Perhaps Connor has a new survey that I've not heard about. Glaeser Glaeser Glaeser Glaeser Glaeser GLAESER Glaeser! Mark your calendars: Ed Glaeser delivers the Economics Department's Condliffe Memorial Lecture on Wednesday, 10 July. Ed Glaeser is the world's best urban economist (says me). His book, The Triumph of the City, is the culmination of decades of serious work on urban issues. Do register for his talk and attend. What if humanity stopped urbanising? What is the role of cities in promoting economic growth? What are the lessons for the Christchurch rebuild from cities around the world? I'm really rather looking forward to this. Glaeser is one of the Elder Gods in the Pantheon of the EconGods. Our department's fine Condliffe lectures: Hausman, Grossman, Blaug, Slemrod, Varian, Plott, Weitzman, Cochrane, Glaeser. Want a single picture illustrating the problem with Christchurch's rental market? Thanks to a hard-working boffin at MBIE, here's a nice one. Those renting a property in New Zealand lodge a bond with the Tenancy Tribunal. The graph comes from their data, via MBIE. We see a massive drop in the number of new tenancies at lower weekly rentals and about as many higher-rent tenancies as there were pre-quake. The graph above shows the absolute drop in lower-rent tenancies. We can also graph things cumulatively to show the change in the proportion of total rents at each rental band. * The rightward shift in bonds paid is rather pronounced. But without data linking addresses to bonds paid, it's pretty hard to distinguish between a few potential stories. The graph cannot tell us whether we simply had destruction of low-end properties and no change in the rest of the market or across-the-board destruction and then shifts in the price of lower-end properties such that the number of tenancies in the $400-500 per week range remained roughly constant. It seems almost certain that both were going on, but we can't really say much without address-bond-linked data. Also, the bond data only captures new bonds lodged. Some of the decline in new bonds posted could be due to tenants being reluctant to shift where rental availability is thin. Some of the drop in bonds could also reflect a shift of rental properties into the short-term holiday home market. On the other hand, many long-term tenants may have been displaced where either the house needs to be repaired or where the owner wishes to live in the house while the owner's home undergoes repair work. Either way, the new-bonds-posted data gives a reasonable reflection of the going price of current rentals in Christchurch. Or, rentals as of 2012. In 2010, there were 18,094 bonds posted. In 2012, 14,695. That's a 19% drop despite rather a few homeowners needing to rent a property. Thanks to MBIE for providing useful data and discussion! * Some browsers have problems with the embedded Google Docs graphs. SciBlog's WordPress implementation also usually gets cranky about it. So here are static image versions for those needing them. I like science. But I'm not convinced that pouring money into producing more scientists is the most effective way of generating the great things that come from science. Award prizes for those making worthy discoveries. But, if the basic research is expensive and if research teams have a hard time getting investor funding for prize-seeking, then this may still underprovide discoveries. Prizes are great when you know what achievement you'd like to fund but you don't know who's best-placed to provide it. Award grants to research teams likely to provide discoveries. This requires the granting agency to be able to pick winning teams and, in small countries, can yield nasty procedural tradeoffs between nepotism (the awards committee gives money just to their friends or to people doing politically favourable work) and administratively expensive application methods. Be really generous with baseline University funding, then revise slowly over time to focus funding towards institutions that produce a lot of discoveries so that Universities sharpen incentives. We've moved toward this in New Zealand with PBRF, but the whole process is ridiculously administratively burdensome, the amount of money at stake is pretty small relative to overall University budgets, and because new and important discoveries are pretty rare, the whole thing seems to reward number of journal articles. If one University produced two field medalists, that would get it a couple of PBRF As, but plenty of other places will get plenty of As without field medals. There's basically a big upperbound truncation problem where truly stellar work - the kind that should wind up getting the really big prizes - is under-rewarded. Encourage lots of kids to take science degrees. Encourage the Universities to expand their science offerings by paying them extra for kids taking science courses and for degree completion in the sciences as compared to arts or commerce. Increasing the supply of scientists could reduce the cost of scientists and thereby increase the supply of discoveries from those places that hire scientists. In a small country, you cannot really have much of an effect on equilibrium wages in science as you'll just induce post-degree out-migration. And to the extent that science grads get hired in applied shops that, while great, largely internalise the benefits of what they're doing, you've not done as much to get the new discoveries. I expect that optimal policy would involve some combination of the first three mechanisms. Prizes in combination with baseline university research funding would solve some of the problems we'd otherwise have in providing extra rewards for truly top-notch stuff. And grants can help if there are particular things you want done and you think you know who can do it. If those together work to build demand for scientists, then that can automatically start pulling more kids into science when they see rising salaries and better job prospects. What do we get when we push a lot of kids through general science degrees instead? Andrew Norton at The Gratten Institute has a few numbers for Australia. The annual Graduate Destination Survey (GDS) of people with recently completed bachelor degrees consistently finds that people with science qualifications have above-average difficulty finding work. The only exception is for people with degrees in the geological sciences. Three years on from the GDS, the Beyond Graduation Survey shows that the job outlook of science graduates improves with time. After a slow start their employment rate is only slightly below average. But this is not evidence of strong demand for specific scientific knowledge. Only 57% of science graduates say their qualification is important or a formal requirement for their job. It is the second lowest match between qualification and discipline. Nobody doubts that science and maths skills are important to Australia’s future. In some specialised areas, employers might struggle to find suitable graduates. But no enrolment or employment data suggests that we are headed for general shortages of science and maths graduates. The science applications boom may turn out to be a higher education bubble waiting to burst. If it does, thousands of intelligent and capable young people may be left with qualifications that hamper their ability to find meaningful and rewarding work. Note here that the point isn't that "being employed in a directly relevant profession" is an important measure of a degree's fitness - in that case, dentistry would be the best degree ever. Rather, it speaks to whether there's any great shortage. Were there a generalised shortage of scientists, we would expect most graduating scientists to be snapped up by employers desperate for scientists. 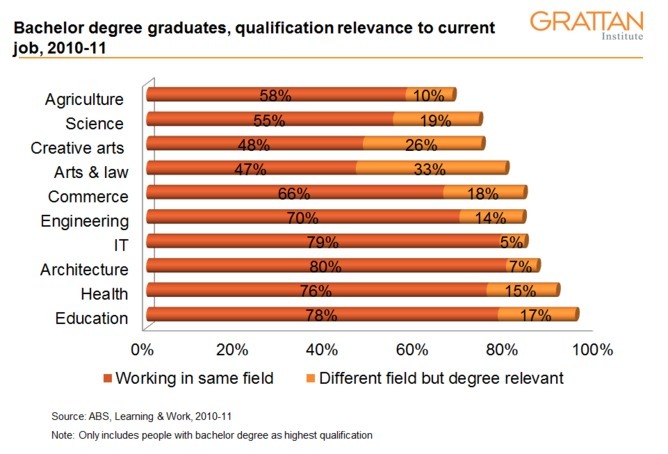 Instead, if we look at the underlying data, we see that only 63% of those graduating with life sciences degree and 65% of those graduating with a degree in the physical sciences say that their qualification is either a formal requirement or "important" for their job. 24% of those with a life sciences degree and 19% of those graduating in the physical sciences say their degree is not important for their job; the rest say "somewhat important." I wonder what the NZ numbers would look like. The running joke on Big Bang Theory is that scientists make little unless they manage to luck into a good job with Pharma. Bernadette waited tables while doing her PhD. Two young physics faculty members share an apartment; their neighbour, a waitress, hasn't got a roommate and consequently has more substantial money problems. Another physicist only has any money because his father sends him remittances from India. A university engineering technician doing NASA-level work lives with his Mom. Closer to real life, Noah Smith explained grad school in the bench sciences. Want more of the good stuff that comes from basic science? Find better ways of funding basic science. I've wondered what would happen if somebody added up all the various social cost figures, so I'm glad to see Bernard Keane on the case over at Crikey. Here's the grim tally. By Crikey’s count, various health and social issues are claimed to cost us over $260 billion, in a $1.5 trillion economy. And this is only a selection. A recent Guardian article suggested there was a massive economic cost caused by masculinity – imagine the cost to society of all the problems men cause? Not that women get away scot-free -- being young and female is also a problem as far as the public health lobby goes, given girls just want to have fun. Still, in a contested policy and funding market place, you have to sell your issue, no matter how objectively important it really is, as effectively as possible. Note that somebody reckoned the dodgy $15b figure wasn't big enough and so turned it into $36b. It’s more difficult if you’re an NGO charged with lobbying for non-economic outcomes, or a public health outfit that wants more money or regulation for a particular problem. You can’t point to lost jobs as a direct consequence of policy. Many health problems, for example, cost governments a lot of money to treat. But that money actuallyemploys people -- doctors and nurses and other health professionals. That’s where “social costs” come in: the costs borne by everyone else of individual decisions. And, in particular, lost productivity. That’s the new black for, particularly, the health lobby: show that your particular issue causes massive lost productivity that is a substantial cost to the economy. That’s the way to the hearts of hard-nosed decision-makers: show them the economic benefits of dealing with a particular issue. If you can throw in other social costs, like the cost of the criminal justice system, even better. And with health problens there also the cost of "lost wellbeing", which is measurable but not an economic cost unless it affects productivity or consumption. The bulk of the costs measured in the cost of alcohol studies fall on the drinker himself; it's only by assuming that drinkers get no enjoyment from consumption that these outfits are able to count private costs as social. Update: Detmackey, in comments, points to one that we'd all missed. The 'economic impact' of incontinence is apparently $42.9 billion. There is a time and place for non-traditional monetary policy mechanisms. In a world in which deflationary pressures are strong and the Reserve Bank has hit the zero-bound on interest rates, then standard monetarist macroeconomics and the new monetarists would recommend doing other things increase inflationary expectations. Standard theory tends to expect problems in worlds combining nominal wage rigidity and deflation. And if the Reserve Bank can't accommodate with nominal interest rate cuts, then things like quantitative easing - or money-printing - start being recommended. If you're keen on the debates around this kind of macroeconomics, start reading Scott Sumner, Stephen Williamson, Nick Rowe, and the macroblogs. Nolan at TVHE more frequently covers this too; I generally try to stay out of macro. So "printing money", per se, isn't utterly insane. It can be a pretty mainstream response to a very particular and fairly rare set of circumstances. Not all macroeconomists agree about it, but it's within the mainstream for the set of circumstances that held in some parts of the world over the last few years. But not today's New Zealand. While we're currently below the bottom end of the RBNZ's target range, that is not going to last. If the RBNZ thought it would, they could and would lower interest rates further. But they're not doing it. Why? Construction pressures are pushing up in the non-tradeable sector. Further, the depreciation that would come consequent to any serious monetary push, whether from printing money or from big interest rate cuts, would push up import prices and then put more pressure on inflation rates. They're targeting 1-3% over the medium term and seem on track to be there. iPredict has medium term inflation looking to be under 2%, but over 1%. And so the debates over the Greens' "let's print money to pay for the earthquake" policy have been a bit disappointing. First off, the Greens have been spectacularly wrong when they've argued that their policy can't be all bad because so many other places are running quantitative easing. Imagine a doctor prescribing a pretty aggressive chemotherapy treatment for a patient who only has a cold. When everybody says he's nuts, the doc replies "Well, Jim over there's on chemo, and it seems to be helping him!" There's a time and a place for aggressive chemotherapy and for quantitative easing; NZ right now isn't it. On the other side, there's been a bit of overstatement claiming that it can never be consistent with standard macro to print money. But I did enjoy The Civilian's caricature. Finally, rather than admit that they were really wrong, the Greens instead pulled back from their policy by saying they couldn't see getting sufficient support for getting QE through - like it's everybody else's fault for thinking that doctors shouldn't jump for chemothearapy for colds. I hate how economic models prescribing particular corrective interventions for particular sets of conditions get used to justify those policies in every other state of the world. Keynes said to run deficits during recessions; politics turned that into running deficits all the time. Market failure theory says we might want Pigovean taxes for costs people impose on others; politics turns that into excise taxes for costs people impose upon themselves. And then there's Russel Norman. UPDATE: I totally do not want to be slamming Russel Norman if he's changed his mind about the merits of QE under the current circumstances rather than the political feasibility of QE under the current circumstances. Any politician who changes his views on the basis of the evidence should be lauded for the change rather than condemned for U-Turns. Dr Norman supported money printing as devaluing the currency, as the United States and Britain had done, saying at the time that "New Zealand can no longer afford to be a pacifist in a currency war". Asked if he still supported the policy, he said the consensus position was that while the official cash rate remained close to zero (it is 2.5) there was not a clear role for quantitative easing. "But were the OCR to drop close to zero then QE would come back into the agenda." In that circumstance he believed the Reserve Bank Governor would look at quantitative easing - as he actually can now. If the cited consensus is that among economists that you don't run QE when at NZ's current position, and that he's reversed because that's what professionals who work in the area think, then I offer enthusiastic applause. But I think that Norman is misreading international monetary policy. QE may have had the effect of devaluing the US dollar, but its purpose was to raise inflation expectations and to avoid a liquidity trap. And even places like Switzerland, which has run some active exchange rate targeting, have done it not to boost exports or make manufacturers happy but rather because devaluation can be a way of escaping from a liquidity trap. Devaluing is something you can do to loosen monetary policy at the zero bound. And, again, New Zealand is nowhere near the zero bound. I wish that the NZ Greens would take a more interesting monetary policy position, if a Green party is determined to have a position on monetary policy. Imagine Russel Norman commissioning a few reputable academic macroeconomists to look at whether NGDP targeting would make sense in a small open economy, then just adopting whatever came of it. I'm not convinced that NGDP targeting would be much better than our current regime, but it's defensible. It's something potentially backed by a growing group of respectable macroeconomists. It can't be dismissed as simple money-printing. And it would give nice talking points about using monetary policy more actively to support the economy during downturns than we might expect in an inflation-targeting regime. A million dollars a meter to extend Wellington's runway. The airport announced in May that it would be seeking resource consent to extend the airport by 300m at a cost of $300 million to attract long-haul flights to the Wellington region. The costs of the runway extension are reasonably well known. But what about the benefits? All passengers wanting to get to Wellington will enjoy a slight increase in safety. If they value this, they'll be willing to pay more for flights to Wellington. The airport should then be able to extract slightly higher landing fees. Passengers from overseas wanting to get to Wellington will enjoy a slight decrease in expected travel time as fewer of them will need to connect in Auckland (or Christchurch) to get to Wellington. Again, if they value this, they'll be willing to pay more for flights to Wellington. The airport should then be able to extract higher landing fees from those international flights. If the change results in increased passenger arrivals in Wellington, then Wellington may benefit from increased tourist traffic. As always, we would need to be careful in estimating such benefits. First, spending by itself isn't a benefit; increased profits accruing to Wellington businesses are. Measures of "economic impact" that take total expenditures as a benefit are rather misguided. Wellington Council might be justified in putting a bit of money into the airport extension, funded by increased levies on businesses most likely to benefit from increased tourist and conventioneer flows: restaurants near tourist spots, hotels and the like. There's little case for central government getting involved except where the extension results in a net increase in travel to New Zealand as a whole rather than just travel to Wellington. At least some of the benefit to Wellington will be a cost to Auckland and Christchurch in terms of travelers who would otherwise have enjoyed a layover in one of those cities before continuing on. And so any case for central funding would have to be based on net increases in tourist flows to New Zealand as a whole weighted by the likelihood that those travelers use Wellington as a base for more extensive travel. Central government might watch that any business case for Wellington Council funding not be based on trade diversion from Auckland and Christchurch. Bottom line: if this were really a good idea, Wellington Airport should be able to fund the bulk of it via a bond issue that would be paid by increased landing fees consequent to the extension. If the main benefit is from increased arrivals from large jets, then set differential landing fees such that those enjoying the benefits are the ones bearing the costs. Makes travelers willing to bear greater landing fees, so can be fully internalised by the airport. Possible, and harder for the airport to internalise. Note that much of this would be diversion from other NZ schools rather than a net increase in international student numbers. Wellington might not care about this, but it weakens the case for central government funding. Possible, and also harder to internalise. You can imagine mechanisms like local tourism operators paying for inclusion in a brochure handed out to incoming tourists, but that's pretty imperfect. Should be fully internalised via landing fees. Um, no. This is one of the big rules in cost-benefit: you CANNOT count BOTH the increased benefits from an amenity AND the resulting increase in local asset values. That's double-counting. Easier for Wellington-based firms to work internationally. This would be partially internalised via landing fees paid by those firms, parking fees at the airport, and taxicab slotting fees, but only partially. This should be fully internalisable via landing fees. Again, be careful to assess things based on net likely increases in total tourism. A compilation of bits from 'round the traps. Nolan over at TVHE has been on a roll lately. I particularly endorse his critique of the Labour/Green manufacturing inquiry and his critique of Key's trying to push RBNZ beyond its mandate and capacity. Both of these have saved my having to add anything. Brennan McDonald chalks the Labour/Green manufacturing policy up to rent-seeking: the parties wanting Ministerial rents and playing to public biases to get it, and manufacturers running normal rent-seeking. I'd amend slightly: if voters are better at detecting dissembling than at understanding economic policy, then we'd expect MPs to share their base's biases. Mark White on the dangers of Nudge policies. Jessica Irvine reports on 43 recommendations from the former head of the Oz Productivity Commission for boosting Australian productivity. Note that NZ is well ahead of Oz on numbers 1, 2, 3, 5 (though Labour wants to re-implement it), 7 (although the taxi camera regs and dispatching rules here work to similar effect), 8, 9, 11, 19, 21, 22 (barring RONS), 23, 24, 27 (though Labour/Green would reverse), 30 (if we believe that the RIS is more than a tick-box), 34-35 are underway, 36 (though Labour/Green would reverse), 37, 42, and 43. I'm not sure we're worse than Oz on the others. Stupid tyranny of distance and inefficiency of scale. Chris Bertram on the dangers of the surveillance state. The Church of Rationality walks us through the econometrics of bicycle helmet mandates. As is often the case, the standard for statistical evidence in med journals, the BMJ included, is pretty bad. If you're testing for the effects of cycle helmet laws, you probably shouldn't correct for cycling-related injuries. Alex at Marginal Revolution on the Oocyte Cartel. I'm not sure that Wellington Council, and the other local bodies, are setting out to create rents for property owners in soon-to-be-designated "fun" districts, but that's what they're soon to achieve. The alcohol reform legislation pushed alcohol regulation back to local bodies; local busybodies have consequently gotten busy lobbying local councils to restrict hours of operation and number of licencees. This was pretty predictable. Industry has an easier time pointing out problems with proposed regulations to central government than fighting all the local low-opportunity-cost types at all the various local Councils. The trouble is that nightlife districts have a life cycle. They don’t spring up and stay interesting and youthful forever. They stagnate and get superseded by other districts. That stagnation happened about ten years ago in Courtenay Place. It's now a big brewery-controlled, noisy, cigarette smoke-filled (that's right) ghetto. The trouble is that no-one has told the Council or the Hospitality Association. Courtenay Place has become a model for everything that can go wrong in a nightlife district. Do I need to make the case here? I hope not. We've seen the same movement around Christchurch, even pre-earthquake. The Strip was the place when we'd moved here, but was on the downturn when the quakes hit. And since the quakes, Riccarton, Papanui, Sydenham and Woolston have picked up. They wouldn't have if Christchurch had the kind of regulation that Wellington is proposing. And if you imagine that a Council couldn't be daft enough to continue enforcing a nightlife-zone after an earthquake demolished the nightlife zone, you haven't been following post-Quake Christchurch closely enough. The nightlife-zoned areas will, by virtue of regulatory protection, get substantial rents. These will be capitalised into the price of properties in that district. But the Council, who seem to think the scenes in Courtenay Place late on Fridays and Saturdays represent “vibrancy”, and the Hospitality Association, led by individuals who, I believe, own businesses in Courtenay Place, are planning a regime that will penalise anyone trying to establish a business anywhere else – businesses that might give discerning consumers an alternative to the chaos on Courtenay Place. It may not be what the Council intended, but it’s what’s called an unintended consequence. It’s what happens when you draw lines on a map and create differences between the two sides. Of course not all the results will penalise businesses outside the strip. If you’re a Courtenay Place property owner learning that your tenants have privileges with respect to liquor licensing, you’re going to put their rent up. I look forward to hearing the Hospitality Association complaining about sky-rocketing rents in the street in about a year’s time. Dominic is absolutely correct here. If we've learned anything from Public Choice, it should be that we really really really shouldn't go about conferring rents in this way. Current owners will get a one-off bump in property values, but then will only be earning normal returns on that capital value. And they will scream if you ever try deregulating it. Christchurch is considering the same kind of lunacy in its local alcohol policy deliberations: they want to push all the nightlife into the now-deserted downtown. In doing so they will severely punish everyone who got off their arses in the last couple of years and helped make Christchurch less awful by getting new venues going in new areas. Admiral Akbar Tullock screams at you, "IT'S A TRANSITIONAL-GAINS TRAP!!" It's happened before: just look at New Jersey and Manitoba. Please listen to Admiral Tullock. Before it's too late. I sometimes point out to my Economics & Current Policy Issues class just how little land in New Zealand is taken up by all the things folks like to worry about. If someone asked you how much of New Zealand was built upon, what would your guess be? 5% or 10%? More? Less? And to what extent would this affect your views on urban development and expansion? There is a widespread view that too much of New Zealand is being built upon: along with cows, the main thing we are growing are houses, and that not only are there too many houses but they are also eating into valuable farmland and nature. There are many reasons for this view, but at a popular level the main reason might be that growth and development happen in areas where people tend to move or travel. People also tend to go where other people are and then complain about there being ‘too many people’. Many folk see new development and extrapolate out to development they cannot see, which often does not exist. A look at the numbers bears that out: less than 1% of New Zealand is built up, including landfill and highways. Clearly New Zealand is not filling up. Compared to other countries in Europe, New Zealand has very few people and very little land built upon. About 9% of the United Kingdom is built up and 15% of the Netherlands. Even the United States, with more than 300 million people, has only 5% built on land. Of course, not all of New Zealand can be developed, but the notion that there is cause for concern at this point in time (or in the next few hundred years) is untrue. There is absolutely no absolute shortage of land in New Zealand. There is a shortage of land on which city councils will allow development, but that's a regulatory phenomenon, not a fact of the physical world. As land gets bid away from agriculture into housing, the price of agricultural land rises. That makes it more expensive to turn the next bit of farmland into a subdivision and makes infill densification incrementally more cost-effective. ** I rather like Steve Landsburg's suggestion that we not turn these sorts of things into moral crusades. BNZ Chief Economist Tony Alexander has a few recommendations to fix the housing market. Let's take them in turn. My comments are the secondary bullets. Initiate a large builder training programme targeting not just youth but low skilled migrants. "Yes, the migrant gates would need to be opened. Just the signalling of strong intention to boost builder numbers would make investors think twice about their capital gain assumptions," he says. Not a bad idea, but I'd expect expansion in builder training to come with increased demand for new construction; it could be that there are hold-ups in the training schemes with which I'm unfamiliar though. I would also note that there is a current massive demand pull for Christchurch. It will be difficult to build Auckland out & up at the same time as we rebuild Christchurch. Ban councils from imposing any development fees and allow developers to install their own infrastructure. A bit further than I'd have gone, but I'll take this over the status quo. We do need to learn from America's municipal utility districts. Create an SOE whose sole purpose is to undercut existing building materials suppliers through bulk purchases from offshore, nodal warehousing and distribution from just three or four locations in the country, with a separate agency responsible for monitoring the quality of materials sourced. I can believe that we have substantial inefficiencies of scale in building supply. But there are so few barriers to anybody who wants to start shipping in container loads of building supplies from abroad, I'm a bit puzzled why we think that inefficiencies would persist once building started ramping up. On the other hand, we have seen substantial materials cost inflation in Christchurch. Count me as skeptical that this one passes cost-benefit. We'd need to pretty clearly state the market failure Tony thinks here is operating and why this is the best way of solving it. I'm reminded of my undergrad macro prof who thought it would be a good idea to have a government-run set of gas stations that used US reference point pricing. Initiate a new large state house building programme relying largely on the to be created new carpenters etc. Constrain new state houses to more efficient building systems including containerised modular housing (this doesn’t involve shipping containers), central and screwed in foundations, etc. Ban house sales to non-residents (even new houses given the ease with which special developments could arise targeting solely folk offshore and soaking up construction sector resources). State housing is really a second-best kind of solution. Where the private sector is forbidden by Councils from expanding supply, I can see an argument for it. But otherwise, surely it makes better sense to allow more building and give poor people money. I'm reminded of the difficulties involved in Housing New Zealand's divesting itself of some $1m+ state houses in Auckland. Impose a tax on all houses owned by Kiwis offshore with the aim of encouraging them to sell them. I'm rather sure that recent numbers have shown few houses are being purchased by people who have no intention of coming here. And recall too that there exists a rental market. For this to screw anything up, it has to be the case that supply constraints remain pretty binding AND that none of these overseas owners rent out the houses that they're not occupying. Put in place a capital gains tax on second properties and farmland and immediately payable stamp duty for all second house purchases. Seamus has carefully provided the many reasons that CGT won't much help. And the Oz productivity commission just recommended the abolition of their stamp duty. Come on. Rezone all land within 10-20 kilometres of existing city boundaries as residential. I'm cool with this, so long as we're not then taxing owners of agricultural land as though Council had provided subdivision-density infrastructure to paddocks. Update: Thinking more on the SOE plan, if Alexander thinks the thing would be profitable, surely the Bank of New Zealand could simply announce some business plan competition where BNZ would provide financing for the best business plan aimed at improving materials supply and distribution. Saturday mornings, I cook pancakes. While cooking pancakes, I listen to Duncan Smith and Susan Murray's Country Life programme on Radio New Zealand (as do all good Kiwis). It's often a wonderful celebration of rural entrepreneurship. The Meatworkers' Union had made it impossible for the farmers to get their stock to slaughter. Sheep were starving in the paddocks because the feed had run out; the farmers had planned on getting their stock to market rather earlier. Country Life interviewed Syd Slee about it. You can listen here. I especially liked the part where the police van showed up. The protesters expected they were going to be arrested. Listen in to hear what happened instead. I was reminded of this interview when Jaime Lee-Ross's private member's bill was drawn from the ballot. His bill makes it easier for employers to hire replacement workers in case of strike. Here's Farrar on the bill; here's Cresswell. I support the bill, and especially if we could have it apply retrospectively to 1978 when it would have done the most good. I'm a bit puzzled about the point given that New Zealand doesn't really have closed shop any longer - we don't lose that many days to strike action any longer. 2011 had the lowest number of stoppages since they started counting in 1986; I can't find more recent numbers quickly. And the Bill will do a great job of mobilising Labour's base to get out the vote. It the game worth the candle? Yeah, I put maybe 25% chance on that panning out. Those odds drop to 5% if it doesn't come in the wake of the current and ongoing NSA revelations. My normal line here is to recommend emigration. But where could you go? If anything, being outside of the NSA / Five Eyes arrangement could make things worse rather than better. A loyal reader who should know about these things rather strongly insists that NZ's leaving that partnership would make it much easier for NSA to snoop on Kiwis. I expect that he's right. Our pulling out of that arrangement would likely result (my guess, not his) in a snooping box being installed somewhere along the line after the termination ends of the undersea cables that connect us to the world. NZ has direct connections only to Sydney and Hawaii. Here's Tech Liberty's submission on the Telcommunications (Interception Capability & Security) Bill. I really hope that the Select Committee moves to fix things. Our five year old got his first scooter about a month ago. He rides it every morning from the parking lot near his sister's daycare over to Ilam School; I walk with him as my office is next door. Then I get to borrow it for the day for runs across campus. It's great. And, predictably, when somebody sees kids having fun, we have to get a freaking movement to ban it. Safekids director Ann Weaver said requiring children to wear a helmet would reduce the risk of serious head injuries. "We do want children to go out and have fun and learn and develop and take risks but we want them to do that safely and the issue is, once you damage your brain you can't get it back. There's only one chance." A Safe2Scoot campaign will be rolled out in August, providing a template safety policy for schools and urging them to introduce a "no helmet, no scooter" rule. The call has been supported by research conducted by Waikato University social science student, Trish Wolfaardt. Her report - Scootering on: an investigation of children's use of scooters for transport and recreation - recommended amending the cycle helmet legislation to include "all wheeled recreational devices, irrespective of the age of the rider". It also recommended introducing a minimum age for scootering to school. "Wearing protective gear will not exempt children from injury, but it will minimise the harm," the report said. WHAT THE HELL IS WRONG WITH YOU PEOPLE?!? Absolutely nothing stops Ann Weaver from bundling her kid up in a helmet and padding if she wants to. The DSM really screwed up by failing to include this particular kind of impulse to ban things in their new catalogue of mental illnesses. Ministry of Transport land transport safety manager Leo Mortimer said it was unlikely that legislation would be changed. "In the same way that we have not considered compulsory helmets for skateboarders. "Scooter riders must comply with all the rules applying to other road users, however, unlike cyclists, they don't need to wear a helmet or use a light at night." ...Waikato acting road policing manager Inspector Rob Lindsay said there had been an obvious increase in children using scooters but it hadn't become a safety issue. Meanwhile, in Canada, some half-wit's suggested mandatory helmets for playing soccer. SOCCER. Where the biggest injuries are from people hurting themselves while pretending to have hurt themselves. Andrew Coyne re-tweeted a few dozen submissions of the things folks my age got up to when we were kids. I don't endorse each and every one of these, but I sure as hell prefer the world where these things are POSSIBLE to the one where we force kids to wear helmets when riding scooters and playing soccer. Here are some of the most fun ones from the list. Note that Monte Solberg, who has a particularly interesting submission, is a retired Member of Parliament. @acoyne @sungriwkowskyc You should have seen the looks I got when I forgot my son's helmet when his class went curling. I was Bad Mom. I can't believe they're making them wear helmets for curling. It's whisky that should be mandatory for curling, not helmets. For those 16 and up. We had massive snowball wars in elementary school. The school dumped all the town's collected road snow in the school yard. We dug tunnels all the way through them, hauled dozens and dozens of buckets of water from the school to the tunnels, and iced the down-tunnels. There were pop-up spots throughout. Then, snowball wars with Viet-Cong tunnels. This is the world Ann Weaver is helping to bring into being. I moved here to get away from people like her. @acoyne My daughter, as part of her Queens Scout @ 13 yrs old, did a 2-night camp in a December blizzard 1.6 km from the nearest adult. NO it wasn't bad. Parts cars out in the pasture were hella-awesome. @acoyne Running the booms on the Ottawa River (10 yrs old). Do recall my Dad telling me to avoid loose logs, but chained border ok! Some of the folks from Kenora in our halls of residence in undergrad talked about how they used to hunt each other in the bush with pellet guns, and then pick the pellets out of each others' backs. @acoyne we used to whip cattails at each other and jump off boathouses into snow banks during Ontario winters. Darwin declares us fit!!! @acoyne in winter we used to hook a tow rope on the back of a snowmobile and with small plasic skis go snow sking at 50kms/hr. Dad would hook our toboggan up to the back of the skidoo. Did the same thing with the horse except slower.
.@acoyne I missed the beginning of this convo but fwiw we used to play tackle duck-duck-goose.Which is exactly what it sounds like. @acoyne we also strapped life jackets to our BMX bikes and built a ramp to jump them into the river. @acoyne My phys. ed. teacher would turn off all the lights in the gym, plug in a strobe light, and let us run around screaming for 20 mins. @acoyne also briefly caught my jacket on fire lighting fireworks with hairspray bottle. And shot pellet guns at each other's backs. Bet he's from around Kenora. @acoyne Filling model airplanes with lighter fluid and seeing how far they would "fly" after lighting them was quite popular as I recall. I remember soaking hard snowballs with petrol and seeing whether we could light them. @acoyne @apalanca We used to put each other in used earthmover tires and roll them downhill. Bonus points if you hit the wall. @acoyne We invented a game called DodgeBrick. Suffice to say it lasted three quarters of a lunch hour, and got two of us suspended. Um... think I agree with the teachers on this one.
.@acoyne We used to deliberately toboggan into trees and let the momentum from the impact throw us further down the hill. @acoyne Our version of murderball was one guy whipping a tennis ball at the rest of us who willingly lined up against a wall. In winter. @acoyne 2L bottles, fill with water, ripped up tin foil balls and Drano in that order. Cap it, shake, toss and run. Called them Drano Bombs. That'd be a felony these days. Think I'm kidding? @acoyne I've been missing the fun. We used to put a handful of wheat down the barrels of our pellet guns and shoot each other in the legs. Again: I'm not saying that the kids should be trying each and every one of these things. But I sure prefer the world where it's possible than one where none of them are. New Zealand is still mostly outside of the asylum on this stuff. But outfits like SafeKids are trying to end it. We shouldn't let them. There has to be ONE place in the world that doesn't succumb to the madness. Jason Sorens's Coalition for Fun: needed now more than ever. Update: Final word goes to Steve Sheere, restoring my faith in New Zealand. * As ACC is reporting scooter accident claim numbers have been rising, there's at least data that could allow for this kind of test. If there's US data on scooter and bicycle injuries that we could use as proxy for rider numbers, then this could be rather fun.